Snakes are usually classified as a pest species due to people's fear of the animal. However, trappers must take care to avoid being sprayed. The important thing to know is that most snakes are non-venomous, and pretty much none of them are aggressive. That is, no snake will slither up to you and attack you. Most will run, and some will stand their ground, but if you leave the snake alone, it'll leave you alone. That's how it works for most animals. Snakes live in a wide variety of habitats. Some are great climbers, some are aquatic. Most are very patient when it comes to catching prey - they sit still and silent for a very long time, then when a prey item is in reach, they strike! Some kill by venom, some by constriction. Some just grab bugs and eat them. There's too many snake species to catalogue here. Some facts common to all snakes - they have no eyelids. They smell with their tongues, by flicking the forked tongue out and tasting the air with the Jacobsen's organ. They are carnivorous. Some give birth to live young, but most lay eggs. One myth about snakes is that if a snake has a triangular head, it is poisonous (venomous). This is not true - most snakes have triangular heads. As reptiles, their body temperature is regulated by surrounding temperatures. Sometimes they'll sunbathe to raise temperature. Many snake usually prefer to hide under heavy cover in cool areas. All snakes are strictly carnivores, and since they can't chew, they swallow their food whole. The poo and pee out of the same hole. Since many people ask me, I have posted photos of what snake poop looks like. The primary concern seems to be fear of snakes (Ophidiophobia) which many people have. It's a common phobia, and I've seen it many times. I've seen adults cowering up on chairs, shaking. It's irrational, but very real for some people. Even for those without a flat-out phobia, snakes are often unsettling. Often it's just a matter of ignorance - people don't know which snakes are venomous and which are not, so they are naturally cautious around all snakes. Snakes inhabit many ecological niches, and often around human buildings. They'll get into pools, screened porches, and oftentimes, the home itself. Snakes don't need much space to enter a home. WHAT SHOULD I DO IF I'M BITTEN? First of all, if you were bitten by a venomous snake, it's most likely a pit viper - you'll have been punctured with large sharp fangs and immediately your flesh will start to dissolve - it'll be excruciatingly painful and immistakeable. 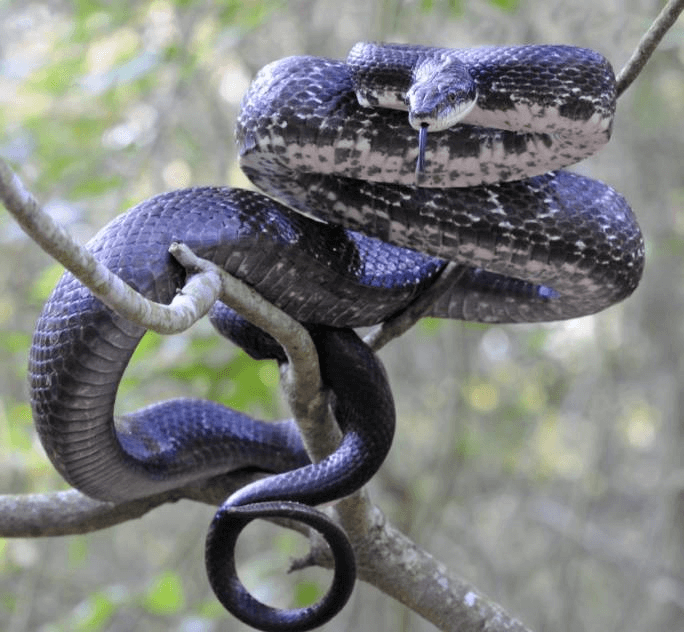 If you've just gotten a little nick from a harmless snake, you might actually bleed a lot, because snakes often have anticoagulants in their saliva. If it's not a pit viper, such as the red-yellow-black Coral Snake, then you won't have the searing pain, since that's a neurotoxic venom. Anyway, here's what you should do - try to remember what the snake looked like. If you can safely gather the specimen, do so, but NOT at the risk of receiving another bite! Call emergency services - an ambulance - if you think it's a venomous snake, or have a friend drive you to the hospital. Don't drive yourself, for risk that you'll pass out on the way. Don't bother with tourniquets, cutting the bite and sucking poison, or any of that crap. It won't help. If you've got a snake on your property, you might just want to leave it alone. It'll be on its way. If you see it habitually and don't like it, then you might want to have it removed. If you've got a snake inside your house and you are unsure of the species, don't try to catch it - most cases of snake bite actually occur when a person is trying to kill or catch a snake. Leave it alone, or isolate it if possible. A wildlife control expert can come and remove the snake. In addition, in some cases we are able to use snake traps to catch snakes. Trapper Jack Wildlife Specialist offers Full Home Exclusions which is a form of sealing the structure so that snakes cannot enter at all. Of course once preventative measures have been taken, we then will offer a warranty to insure the workmanship has been done properly and will remain intact for the life and in many cases longer than the warranty is intended. Many people mistakenly assume that all snakes are poisonous - the correct term is "venomous", because snakes inject venom, whereas poison is a more generic term. The truth is that there's no easy way for amateurs to tell - so just leave all snakes alone! If you must know, your best bet is to simply do a web search for the venomous snake species in your state, and memorize what they look like. Finally, with the exception of the red/black/yellow coral snake, most venomous snakes in the USA are pit vipers, which are very fat snakes. So if it's a thin snake, it's probably harmless. The pit vipers are all rattlesnakes (and all rattlesnakes are venomous!) or fat water snakes, like the cottonmouth or copperhead. Of course, harmless water snakes are also pretty thick, so it's hard to tell. And pretty much all snakes have triangular heads or patterns of some sort, so there's no single trait that will determine if a snake is dangerous or not. Best bet - just leave all snakes alone if you encounter one. Most bites happen when people try to catch or kill snakes.